Use the help document that installed with LLPTS to help you configure the ports. For the PMS to begin communicating with the Comtrol interface, a line needs to be added to the settings file "MENUINI.FIL"
At the bottom, add the line "HOTEL-COMTROL=YES". To enable the key interface via Comtrol, add the line "KEY-INTERFACE=COMTROL". Safe the file and restart the PMS software at all terminals. The rest of this page deals with the settings in the Execu/Tech portion of the interface, the Comtrol Interface Manager (Comtrol.exe). Before changing settings, you must first make sure that the scheduled task that runs the Comtrol Interface Manager is stopped. Because of a complicated shutdown sequence required to ensure that no posting transactions are lost, sometimes ending the task won't really end the process, even though it reports that it has. After 30 seconds, check the Task Manager for "comtrol.exe" and end it if it's still running. After ensuring that "comtrol.exe" is no longer running as a scheduled task, you can browse to the install folder and run it by double clicking it. This is the main window of the Comtrol Interface Manager. The main window is filled with a real time log, showing activity between Execu/Suite PMS and Comtrol's LLPTS. Click Settings to display and edit the settings tabs. Save Settings - This saves the settings. Open Application Folder - This opens the application install folder. Settings - This displays the Settings tabs. 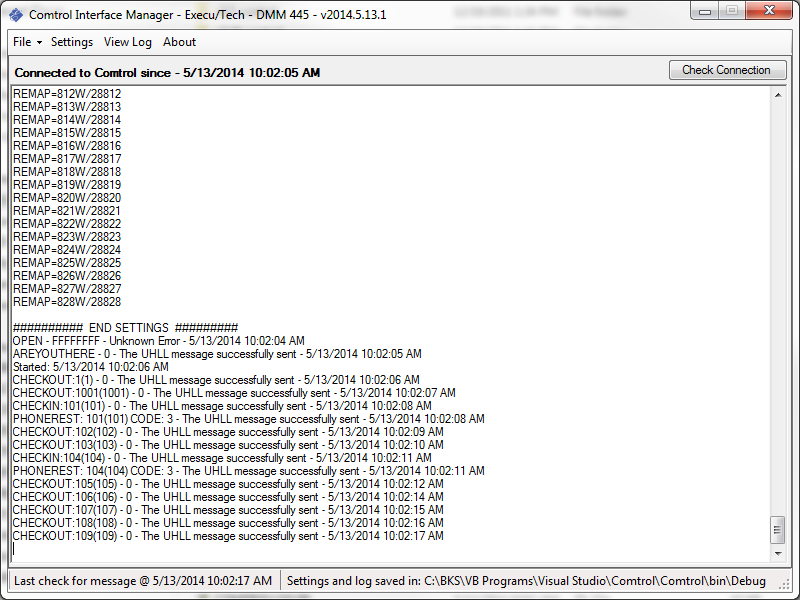 View Log - This displays the current log file. About - This displays an "About" box. Check Connection - This sends an "Are You There?" message to LLPTS to verify proper communication. This is the Settings menu bar. To save the settings, click the "Save Settings" button. To close the settings tabs, click the "Close Settings" button. If you want to save any changes you've made, be sure to click "Save Settings" first. To edit the settings, you must first click the "Allow Edit" button. This will pause the interface until you are finished and either close the settings or click "Allow Edit" again. This is where you configure the communication settings. This is the IP address of the computer running the Comtrol LLPTS service. This is the PORT that the LLPTS service is using for the PMS. Default is 32768. This is the PMS Hotel Company Number. This is the default company number that will be used with communicating between the PMS and the interfaced devices. This is the folder where the PMS software has been installed. This is the minimum delay, in seconds, between message attempts with the LLPTS service. There is no universal optimum speed, but 1 second is a good starting point. Slower computers should raise this until there are no communication errors in the log. This is the number of lines that will be in the log file. The purpose of the log is to troubleshoot recent communication issues so it doesn't need to be very long. 10,000 is the maximum. Some databases contain rooms from multiple unused companies. This happens when databases for several hotels were once combined. If the databases have been split, you don't want to cause unnecessary delays by resyncing hundreds of rooms that don't exist. Specify the company number of the PMS company that still uses this database. This is where you configure the interfaces that are enabled. Different interfaces require different messages to be sent. This is where you configure the PBX interface settings. Check this box to use level of service, or call restrictions. Ignore DMM If you have 2 devices that both send maid status messages, enter the DMM of the device to ignore. An example of this would be having a Mitel PBX and DuVoice voice mail. Because DuVoice also handles maid status, sometimes employees might enter these settings in both systems. However, you must pick one and ignore the other. Enter the DMM of the device that will be ignored. The first digit represents the code that we send to Comtrol's LLPTS and may not represent the code that LLPTS sends to the PBX. However, the description of the restriction should line up with a setting in the PBX because these are common descriptions. We can't change the code that LLPTS sends to the PBX for a particular restriction because it's based on the vendor's specifications. If you're not getting the desired results, try different restrictions - a setting for one vendor might mean something else to another vendor. Phone posting codes are predefined in the PMS, so they can't be configured at this time. Configure the movie charge and tax codes here. Configure the internet usage charge and tax codes here. Configure the games charge and tax codes here. This is where you remap the relation between PMS room numbers and phone extensions. If you have a key interface, you must configure the remapping under the keys tab. If you have a lot of remapping to do, you can create a spreadsheet and save it as a Tab Delimited file and import it. The FIRST column is the PMS room number. The SECOND column is the phone extension. This tab allows you to see pending posts from phone, POS, movie, etc. You can also pause and manually initiate the posting of pending transactions when testing. However, this should only be done when testing posting to the PMS. This function is provided for information purposes only. You must not rely on this function in any emergency situation. There is absolutely no guarantee that this will function properly because there are several pieces to the interface, all of which must work perfectly for proper function. A problem with cabling, the phone system, the server, the interface application, email settings, etc. can cause this function to fail. If all pieces of this function are configured, an email will be sent containing the extension that called 911 and the time the call was placed. This email will be sent as soon as the Comtrol Interface Manager receives the call data containing the 911 call. If the phone system doesn't send these 911 calls, this function will not work. 911 column start If we're receiving raw call data (your phone system is unable to send in any common valid format) then this is the column where the 911 number will appear. You will have to make a call and look at the call record in the log file "COMTROLLOG.FIL". Use SSL Check this box if your SMTP server uses SSL. Get this information from your email provider. CC Addresses This is an optional CC address that will receive a copy of the email. Test Print / Email This button allows you to test the email and print functions. If your key system requires a password for the PMS to be able to make keys, enter that password on this screen. This is where you map the PMS terminals to the key system station number. The PMS terminal number can be found in the bottom left corner of the PMS software window. It's a good idea to set a Default terminal setting in case you add a new terminal and forget to modify this setting. This room number remapping table only applies to key systems. This is provided because it's often not feasible to change the room numbers in the key system at the same time it's changed in the PMS, phone or other 3rd party devices. This is because someone must physically reprogram every door lock, one at a time. If your key system uses the same room numbers that are in the PMS, do not fill out this table. If only a few rooms need remapping, just add those and the rest will use the PMS room number. If your key system uses the same room numbers used in the master remapping table, found in the "Remap" tab on the first row of tabs, you can import from this table. To do this, select Import then Import from Master Table. The FIRST column is the PMS room number. The SECOND column is the key room number. This tab provides a few options to test. You can test the Maid Status Code function. You can test the 911 call alert function. You can test the key interface.